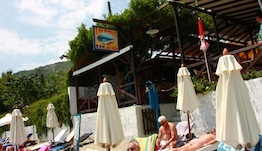 Welcome to Lenio's House and Taverna - Bar "Λενιώ¨ in Megali Ammos beach - Skiathos island. Next to the beach and surrounded by an amazing garden we offer fully equipped studios with the most amazing view to the sea. Traditional Greek taverna Lenio is open all day long offering traditional greek and skiathitian cuisine while our beach Bar is there for you to enjoy cool refreshments or exotic cocktails while on the beach of megali ammos. We are located by the beach "Megali Ammos". There are 2 ways to reach us, one from the beach and the other by the road behind our hotel that leads to the center of skiathos town.